I also at one point used the phrase 'Slight Disimprovement'. That was dispiriting. I was just called up by ICM, the pollsters. And it wasn't a boring one about how many holidays I take or how much yoghurt I buy, it was a proper one about general elections and the expenses row. Great! Like everyone else, I've always secretly felt it was a shame that these polls consist entirely of people who aren't me, and that they therefore do not reflect My Important Opinions. Now all that would change! Now My Important Opinions would at last be heard. Bring it on. Turns out I don't know anything. I'm an idiot. Take away my vote. I might start using it as an exclamation. For full effect, bear in mind this was said while making a 'T' shape on his throat - starting by drawing a finger across it in the sign for 'dead', then drawing a line down from Adam's apple to clavicle. Still, he didn't mean any harm, so just say four Hail Caesars and a Mary Mary, my son. Sadly, I am not very serious, and not all from Highland. But I would dearly love a free month. 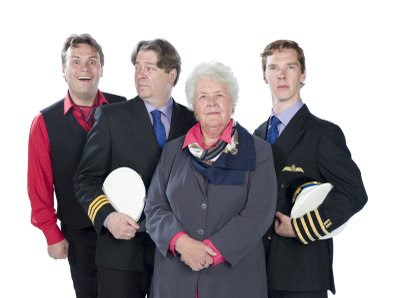 Just to let you know that the second series of my radio sitcom Cabin Pressure, starring Benedict Cumberbatch, Roger Allam and Stephanie Cole, will be recorded in London on the 7th and 28th June, and the 12th July (all Sundays). Tickets are available from here http://shows.external.bbc.co.uk/help/tickets/radio , but it's possible that they'll go quite fast, what with being free and all, so I suggest you get in quick if you'd like to come. Pieces of advertising material that have recently annoyed me - part five of at least three. Wow! Surely, this is the very epitome of daring fusion cuisine - McDonalds, but thrillingly combined with the exotic tastes of western America! It seems like madness, but McDonalds dare to dream. And what is it they most dearly hope to gain from this previously unheard-of 'western' influence on their burgers? Why, sophistication, of course! Because if there's one quality the people of Utah, Wyoming and Arizona pride themselves in having above all others, it's sophistication. They might not be able to rope a steer like those folks in Boston, and you can bet they're always gonna come off worst in a fist-fight with a Parisian, but hoo boy, when it comes to sophistication, they've got 'em all licked.